This picture was taken at the airport in Gran Canaria as we were waiting for our flight home this summer. The image can be used in anyway, referencing time, a clock what ever takes your fancy – let the horror muse take control. "If I'm not there by 10:00, it's too late. You know what you have to do." The envelope had contained only that note and a single, tiny pill. 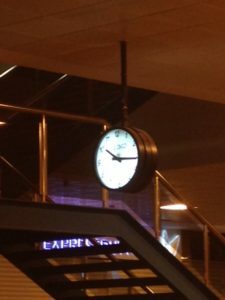 The clock in the station read a quarter past. His fingers trembled as he held the pill. Closing his eyes, he placed it in his mouth and bit down hard. His only hope was the pill would be less brutal than what the enemy had in mind. There was confusion all around. A man had collapsed and died in the middle of the station. Police and paramedics huddled over him. No one noticed when a woman picked up a slip of paper from the floor. "This is my note." She showed it to her companion. His shoulders sagged. "Why did he do it? We were here in plenty of time." "It doesn't say AM or PM. He must have thought you meant morning." "Morning! I thought he understood! What do we do now?" "What do we do? Without him, it's over. It's too late for us, too." The man pulled a small bottle from his pocket. He emptied the contents into his hand. He held up two small pills. Thanks! Just got it in under the word limit!